Just in time for the Super Bowl, YouTube TV is expanding its footprint nationwide. Starting Wednesday, the streaming multichannel video service, which includes linear broadcast and cable channels, as well as on-demand content, is nearly doubling the number of markets where it's available. The expansion positions YouTube TV as a true nationwide OTT video offering. Local broadcast channels in each market are paired with national cable channels that would have been purchased through a traditional pay-TV subscription in the past. The battle among virtual multichannel video providers (MVPDs) is fierce, with YouTube TV competing against companies like Hulu, Sony, Sling TV and DirecTV Now for market share. 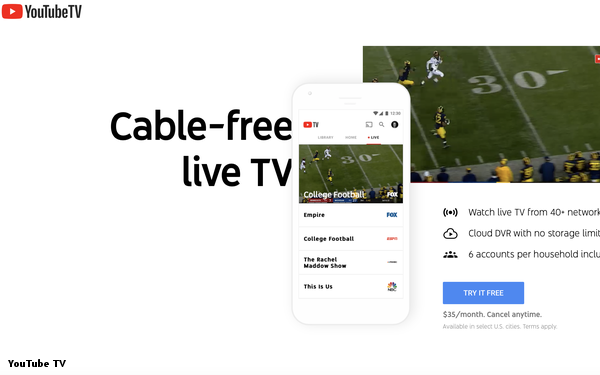 YouTube TV’s advantage is the brand association with the ultra-popular free video platform, as well as parent company Google’s technology and digital advertising expertise. In terms of expansion, one of the big challenges for vMVPDs has been securing local broadcast deals. Each TV market is served by local stations, which may be owned by the broadcaster (an owned-and-operated station) by a broadcast group (i.e Sinclar or Nexstar) or by a local owner. Expanding to each market requires securing deals with the owners of every one of the local affiliates, or with the station group owners. That can prove time-consuming, as Google has learned, given that YouTube first launched nearly three years ago. 1 comment about "YouTube TV Expands Nationwide, Covering 98% Of The U.S.". Ed Papazian from Media Dynamics Inc, January 24, 2019 at 12:29 p.m. Wonderful news, Alex. But why is YouTube TV so reluctant to tell us how many subscribers it has? Have they hit the one million mark yet?